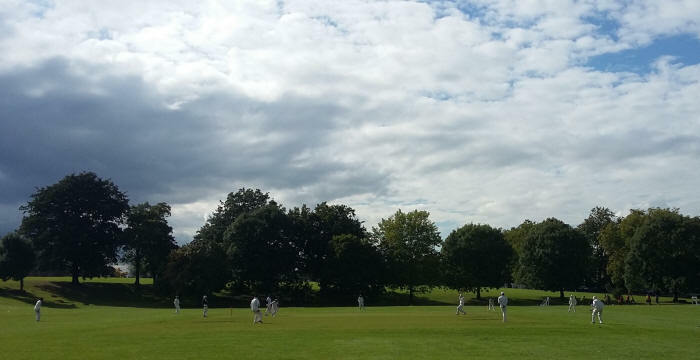 This fixture was reduced to 30 overs each due to inclement September weather but proved to be a thriller. The Nomads won the toss and put us in to bat. Despite a grassy wicket and clouds, the pitch was true and lifeless but a comical suicide run from Hemant Patel saw us 14-1. This became 15-2 when our second opener Raj batted like an IPL tailender and was caught. When Ravi holed out for 27 we were tottering at 59-3. In strode the OF executioner, Farhad Waqar. The hapless Nomads were carved to all parts of Hilly Fields. So dominant was he that in a 91-run partnership with Azaz, the contribution from Azaz was just 17. At 151-4, I demoted myself down the order after hearing of debutante Sakib's batting prowess. His classical elegance contrasted with Farhad's brutal dominance. I retired him on a brilliant 119 and Sakib's 76 not out took us to an imposing 282-7. With nearly 10 runs per over required, the Nomads immediately hit out. When opener Barnes was caught by Raj at short cover for 33 off my bowling, we were confident of defending 282. However, there now followed a show of repeated juggling from our fielders. The Hilly Fields circus act led to opener Chat being dropped 3 times by the same fielder! With 58 needed from 5 overs, the game was on a knife edge. Once again, the Hilly Fields circus performance continuted to deliver a variety of fielding blunders. When Ravi held a catch at deep long on - but then inexplicably parried it for 6 - Steve Hamilton said what we all knew: "ahhh....that's the game (over) ..."
The Nomads exploded into a fit of joyful celebration, much deserved. For us, poor fielding and indisciplined bowling, apart from Farhad and Az, ensured that the OF bowling figures read like bingo numbers : Khan 1-66 off six overs, Shaw 0-65 off five, Raj 0-47 off four and Steve Singh Hamilton 0-29 in 1.4 overs.